Personal Information Profile Make sure you enter the information accurately, and according to the formats required. Fill in all the required fields. I have received this email today, I'm sure that's a phising mail. As part of our security measures, we regularly check the work of the screen PayPal. We have requested information from you for the following reason. Our system has detected unusual charges to a credit card linked to your PayPal account. 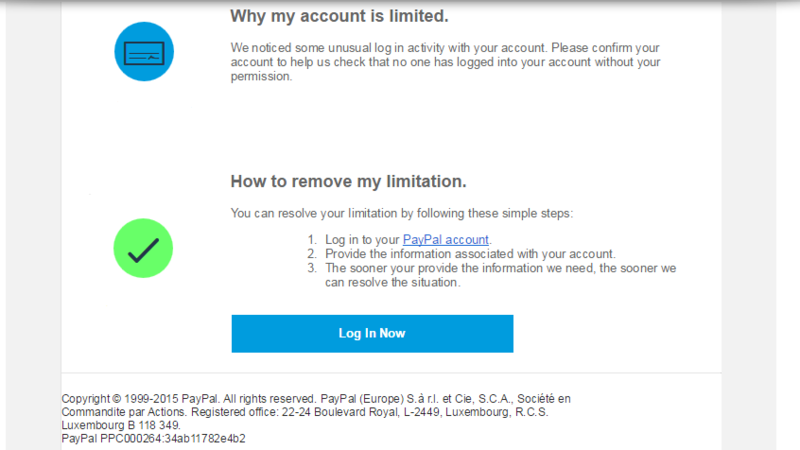 PayPal account, you'll need to relog in in your account. Copyright 2013 PayPal, Inc. All rights reserved. PayPal is located at 2211 N. First St., San Jose, CA 95131. The hackers using a coffe place IP address in Paris for the crime. You just have to track down the sender.I guess this is bunch of kids trying ther hacker skills. I got one too! It was in my Spam folder but I almost fell for it (I had a negative balance for a few days and I thought to have read somewhere that this could negatively affect my Paypal account) but in the end the 'download this and fill it out' instead of a 'go to the website and fill something out' got me suspicious. specialists. We will send you an email with the outcome of the review. so glad I didn't enter my bank account information but I did enter my password. I hope they can't hack into my email. our Ρaypal account has been Iimited because we've noticed significant changes in your account activity. As your payment processor, we need to understand these changes better. Please log in to your Ρaypal account and provide the requested information before March 31, 2015 through the Account Review. If we don't receive the information before this deadline or we notice additional significant changes in your account activity, your account access may be further Iimited. Thank you for your understanding and cooperation. If you need further assistance, please click Contact at the bottom of any Ρaypal page. This is what the email I recieved today looked like. It is very clean and well presented, and I would have fallen for it if I hadn't checked the email it came from and saw that what had looked correct when I initially saw it in the email list was actually showing up as service @ intl.paypaI.com once I got into the actual email. That is a capital I, rather than a lowercase L, and is not supposed to be there. Going through my bookmarked page rather than the link provided showed there was nothing wrong with my account, and thankfully I knew already to send it to spoof@paypal.com. This is mainly just to show what I recieved, cause paypai be phishin.